Provo • A day after coach Dave Rose proclaimed that BYU’s best basketball in the 2018-19 season “is ahead of us and in front of us,” the Cougars were thoroughly dominated by No. 4-ranked Gonzaga Thursday night at the Marriott Center. 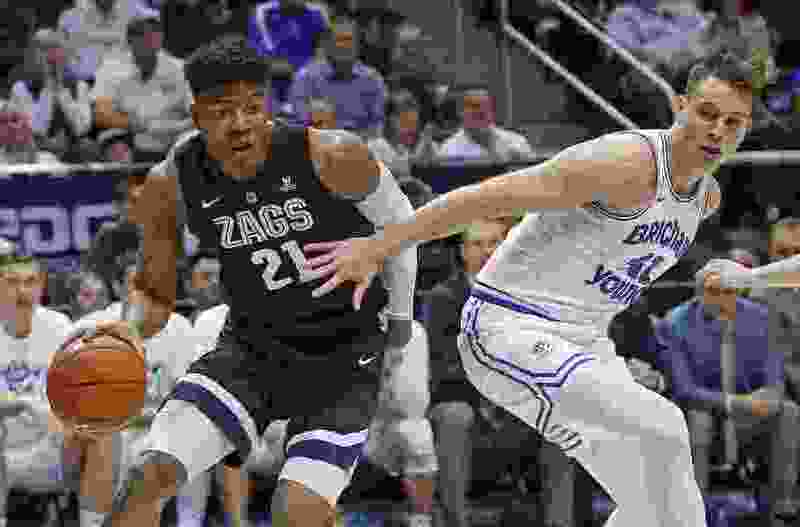 Gonzaga handed BYU its worst home loss in Rose’s tenure, a 93-63 beatdown that might have surpassed New Mexico’s 90-48 thrashing in 1997 for worst margin of defeat ever in Provo if coach Mark Few hadn’t called off the dogs with three minutes, 24 seconds remaining. It was as humbling a loss as the Cougars have experienced at home in quite some time, considering the Zags held BYU to 37 percent shooting and scored 50 points in the paint, many of those points on thunderous dunks. The question has to be asked: Can the Cougars recover quickly from the confidence-sapping, weakness-exposing embarrassment played in front of more than 15,000 fans and a national television audience? If they don’t regroup, they will be in considerable trouble, because Loyola Marymount invades Saturday night with perhaps the best team the Lions (16-6, 4-4) have had since BYU joined the West Coast Conference in 2011-12. Loyola Marymount showed signs of improvement last year when it upset BYU 76-69 in Los Angeles and has continued that upswing in coach Mike Dunlap’s fifth year. The Lions routed Pacific 60-42 Thursday night at home and held the Tigers to 30.6 percent shooting. LMU is No. 131 in the KenPom ratings and No. 144 in the NET ratings, not far behind BYU at No. 108 in KenPom and No. 102 in the NET, which has replaced the RPI system the NCAA used to use to evaluate at-large candidates for the tournament. While its strength this season is defense, with 7-foot-3 Swede Mattias Markusson patrolling the paint, LMU also has the type of quick, penetrating point guard that has given BYU fits in the past. Senior James Batemon scored 28 points on 9 of 14 shooting in last year’s LMU win and is averaging 17.4 points this season. TJ Haws will have to stay out of foul trouble, because when BYU’s second-leading scorer leaves games, the Cougars tend to struggle. Senior McKay Cannon will be tasked with slowing down Batemon, while junior Jahshire Hardnett will probably also get a shot at the Milwaukee native. Hardnett scored seven points in 15 minutes in his first action since the loss at Saint Mary’s on Jan. 5. Luke Worthington started in the post, missed all five shots he took, went scoreless and played just over nine minutes. Freshman Gavin Baxter started the second half in Worthington’s place, perhaps signaling that Rose is ready to make a starting lineup adjustment. “We are trying to help him with his confidence, and get him ready to play as many minutes as he can to help our team, because he is really coming along,” Rose said of the 6-foot-9 jumping jack from Timpview. About the Lions • They are coming off a 60-42 win over Pacific in Los Angeles Thursday in which they held the Tigers to 30 percent shooting. Senior guard James Batemon scored 19 points, freshman forward Douglas Dameane added 15 and junior center Mattias Markusson, from Sweden, added 13. … Batemon leads them in scoring with a 17.2 average, while Markusson averages 11.2 ppg. … They were one of the hottest teams in the country in November, opening the season with wins over UNLV, Georgetown and Boise State. About the Cougars • They were outscored 50-32 in the paint in Thursday’s 93-63 loss to Gonzaga and gave up 14 second-chance points and were out-rebounded 41-31. … They had defeated LMU 10 straight times before falling by seven at Gertsen Pavilion last February. … They are averaging 81.2 points per game, but just 74.9 ppg. in WCC play. … They are 13-3 against LMU since joining the WCC in 2011-12 and have won six straight vs. the Lions in Provo.